Feature Fridays are our show & tell day for individual Canadian bloggers who sew, quilt, or craft in the area of needlework & fibre arts. This includes felting, weaving, hooking, embroidery of all types, knitting, crochet, garment sewing, doll and pattern making too! Look who has been featured so far! (All names link to their feature post...) Newest profiles are at the bottom. If you are a Canadian textile/fibre artist who keeps an up-to-date blog, YOU COULD BE NEXT! Yes, you too! We want to hear all about you. You'll get a feature post here for all our readers to see that will link to your work, photos, and online shops to name a few. The sky is the limit! To be considered, please leave your name, craft, and email to the comments section and we will be in touch. We need volunteers from under-represented regions! I'd love to participate as well. Sewing, quilting, random crafting, home decor... and the owner of newish etsy shop who is on a rather steep learning curve! It is all about playing, creating, sharing. I'm a Jane of many trades but master of none. lol I'm happy to share though. I'm a quiltmaker who loves playing with words. I'd be happy to post some of my word quilts here. I'm Sam from Dawson Creek, British Columbia. I'm a Quilter. I am Jennifer Scantlebury Vienneau and I am a person of fibre! Hi there, Yes, contact me for a feature. Great Idea! I know I've just signed up, but what the heck! I'm Leanne, a soft sculpture doll artist. I'd love to do this. Your site is a fabulous avenue for Canadian bloggers to get exposure. Hi Monika, I'm certainly game! I'm a quilter, fibre artist, instructor, etc based near Barrie, Ontario. Looking forward to WIP Wednesdays too, now that I've found it. I'd appreciate the opportunity, eh! 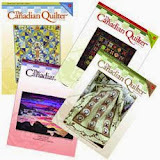 I am a longarm quilter from Ontario. The name of my business is Stitching Impressions. Love to participate. ruthq@rogers.com or stitchingimpressions.com for my blog. Hi I would love to participate. 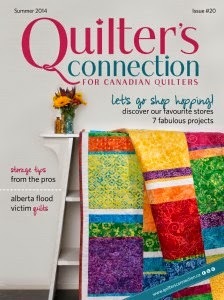 I am a blogger and Modern quilter from Montreal. 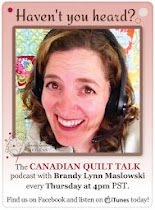 I am co-founder and president pf the Montreal Modern Quilt Guild. I would very much appreciate being featured on this wonderful site that I only just learned about. I am a quilter. My specialty is hexagons. I've published many tutorials and patterns on my blog as well as a monthly block of the month pattern which is inspired by a piece of Canadian art. I am currently running a QAL and it is called Soupcon because the design includes a number of different techniques. 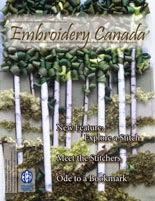 Thank you for this wonderful blog that features Canadian needle artists! I'd love to share a little bit about my blog on this site. I'm Trina from Will Cook for Shoes (www.willcookforshoes.ca) and I love apparel, household and quilt (appliqué, scrappy, paper piecing) sewing. I also knit, spin, bake and cook! I love the blogging world and get so much enjoyment from visiting all the amazing fellow sites; I have found we are so alike and share the same ups and downs. At my blog, Canadian Needle Nana, I write daily about my life, my recipes, dogs, books I'm reading, and all the needlearts that I try my hand at. 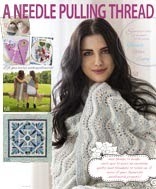 I embroider, knit, crochet, quilt...not a master of any but have a wonderful time trying them all. I live in the country and love nature and gardening as well. I am a busy grandma! I would love to share more with you all in a post sometime. Hope I haven't chewed your ear off!